I brought 4 variants of Fiama Di wills shower gels 3 months back (Read haul post here) but got to keep only two variants aka Lemongrass & Jojoba shower gel and patchouli and macadamia shower gel while my sisters forced me to give them the other two. 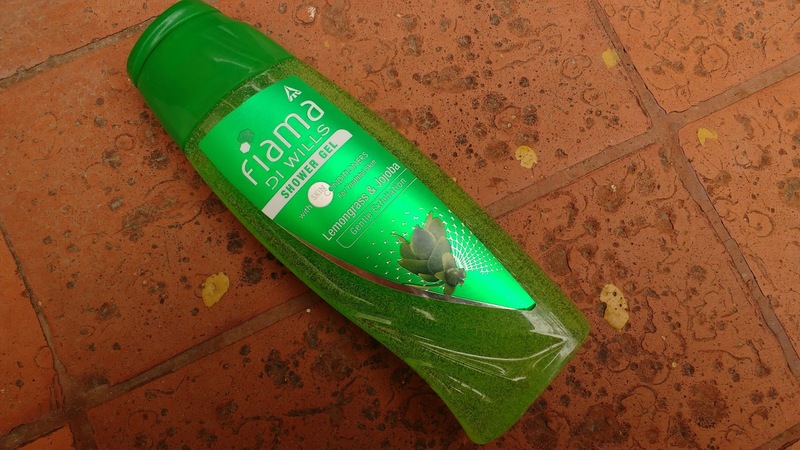 I have been using both the shower gels for the past 2 months and today I will be reviewing the Fiama Di Wills Lemongrass and Jojoba Gentle Exfoliation Shower Gel which I like more than the pink Fiama di wills patchouli and macadamia shower gel. 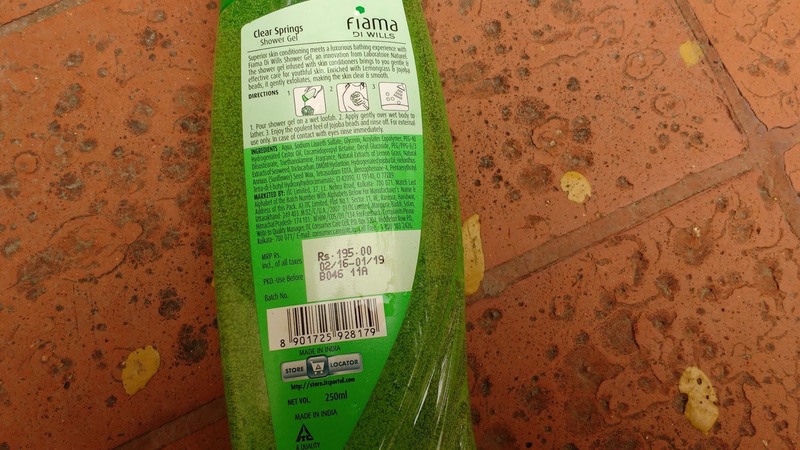 There are five Variants of shower gels by fiama di wills. All Fiama Di wills shower gels come in a transparent bottle with a colour coded flip cap which shuts tight. 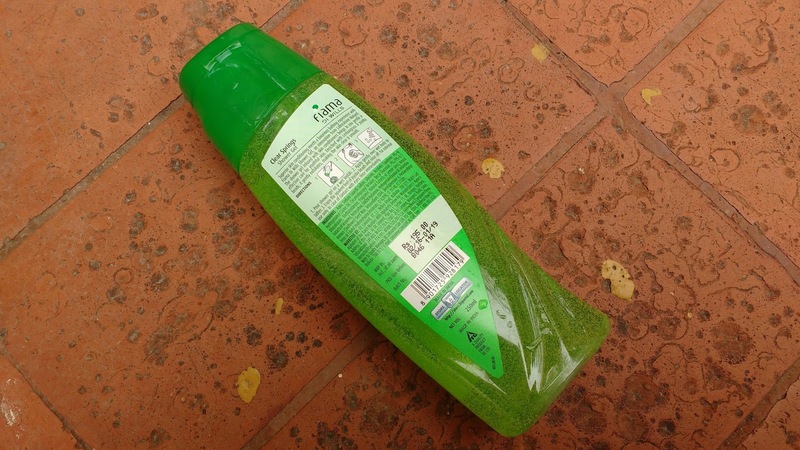 The transperent shower gel actually looks very colourful because the product inside is green in colour and the flipcap is also green giving a very luxury feel. 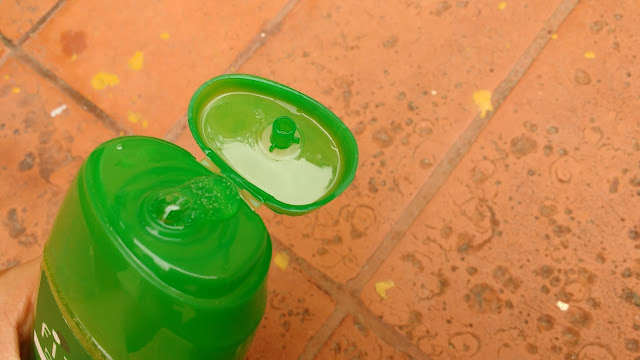 The packaging is leakproof but the bottle is a bit too big to travel around with. I wish these shower gels had travel sized versions too. I dont like strong scented products and stay far far away from strong scented ittars but when the scent has citrus notes I am all for it. This Fiama di wills shower gel has a strong and refreshing lemony citrus smell which I totally love. I have used another variant of the Fiama shower gel but I love this variant more all thanks to the fragrance which is enough to refresh my mood and awaken my senses. I have already repurchased this shower gel and now Iam on the second bottle. The texture of Fiama Di Wills Lemongrass & Jojoba shower gel is a bit runny and on applications it lathers nicely. You need just a small amount for the entire body especially if used with a loofah . The shower gel also gets washed easily without leaving behind any product residue and I am left with a cleansed feeling. This shower gel isnt drying and it has micro beads for gentle exfoliation which i feel is too small to actually exfoliate but if you want to use this shower gel everyday the micro beads are just perfect not over exfoliating in anyway. After a bath My dry skin definitely requires mild moisturizer but my bathroom is left with a blissful lemony fragrance. Even I smell of citrus but the scent barely lasts for 5- 10 minutes wich is a bummer considering how heavenly the scent is. Fragrance doesnt last at all. Would I recommend Fiama Di Wills Lemongrass & Jojoba Gentle Exfoliation Shower Gel? Definitely. This has amazing fragrance but if you have sensitive nose then you may want to stay away. Fiama Di Wills Lemongrass & Jojoba Gentle Exfoliation Shower Gel is my current favourite body wash and Iam just loving its divine scent. It also cleanses well by gently exfoliating. If you love citrus fragrances then you should definitely give this a try.